The short of it is, that when you turn the wrong way, you have to “back-track” to get “back ON track”. Think of Sonic’s video game career like a corn maze. You’re going and going, and you hit a dead end. You can’t hop over, you gotta go back and change course. I can’t say I’m EXCITED for Sonic Forces, but given that Generations, Colours, and half of Unleashed really resonated with fans, it’s a much safer bet than continuing to roll with Lost World (I’ll bite my tongue on that one), and that Boom garbage. Hell, if we’re lucky, we might even see them eventually create hybrid gameplay between this and OTHER successful aspects from Sonic games fans enjoyed. Maybe a Sonic Adventure-style game isn’t out of the question any more. *shrug* Anything can happen at this point….especially considering that the Generations style Sonic game has returned. Are you freaking kidding me? The story and tone of Sonic games from Unleashed onwards was utter garbage. ANYTHING is better than that. Yes, even Sonic 2006’s ridiculous, plothole-ridden story. It was the goofy and Westernized tone of modern games that was a step backwards. But to be fair, Sonic 2006 took itself too seriously, while Shadow the Hedgehog was too convoluted in narrative and Sonic Heroes was too campy (lack of a better word). Also, traces of the recent dense and wacky tone first appeared in Sonic Riders. Considering RoL was like a million steps backwards, suddenly one step back doesn’t feel so bad. The thing is, going for a more serious story isn’t necessarily a step backwards. And like Thro mentioned, there’s plenty of semantics involved when trying to get a series “back on track”, and sometimes that does involve going back to previous ideas, particularly ones that worked well in the past. For many, that means returning to the Boost formula that made Unleashed, Colors, and Generations fun games for almost everyone. But I can still understand why some people think they should be hesitant with the implications of a slightly more serious story premise, since they’re likely equating “serious story” with titles that tried, failed, or even just had mixed results in that department like Sonic Adventure 2 (this I feel is the mixed one, it both does and doesn’t hold up at the same time somehow. Like I could see the game still running with this story, just in a bit of a better style of writing or pacing than what it came out with at the time. ), Shadow the Hedgehog, and Sonic 2006. Despite this false equivalency of “seriousness = edginess”, I don’t feel that a serious tone is necessarily a dangerous thing for Sonic the Hedgehog. No more so than comedy anyway. Let me put it this way, the complaint that I and a lot of other fans have been having with the series lately since the days of Colors was that it was trying to make itself a bit too lighthearted and humorous in tone. That’s not to say that humor doesn’t have any place in Sonic’s series, far from it, it’s still a cartoony blue hedgehog fighting off an egg-shaped mustachioed scientist, there’s bound to be some antics or laughs to be had somewhere. 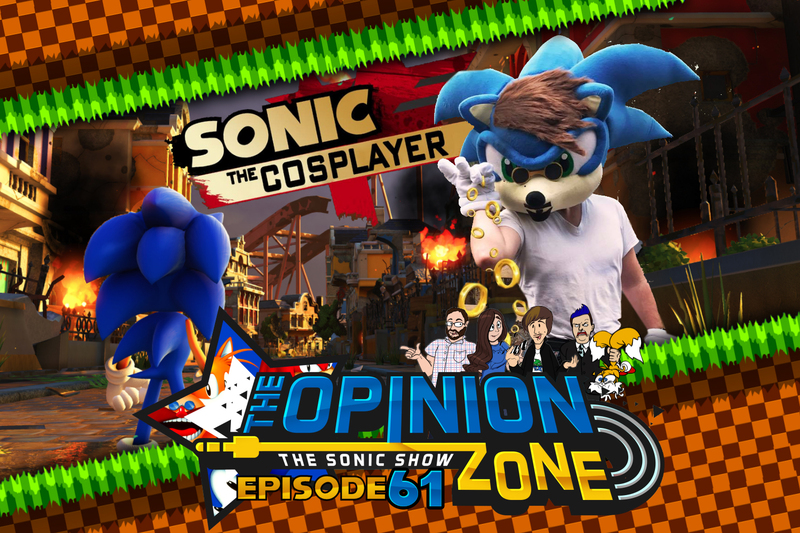 But from the day Sonic stepped into the gaming scene, it never felt like he was meant to lean more towards one way (humor or edge) and not the other, it felt like he was always in some kind of mix in-between. Not a perfectly balanced mix or even a consistent one, but it always felt like he was meant to be in this more neutral area where he had room for both yet was still kind of slightly leaning a bit more towards the side of humor and positivity, again because cartoon hedgehog. The only time things ever felt “off” about Sonic was whenever there was a huge enough tonal shift that really shook him out of this grey area. Now more often in the past this was the result of trying to make a more serious story to appeal to a more “mature” audience, and the way that those stories were handled made the result end up feeling unbalanced, even if they still tried to inject some slight humor in there. But there’s still been moments where the opposite was the problem, particularly with titles like Sonic Heroes. The story, pacing, and writing of that game in particular made things feel so squeaky clean (both in story, models, and gameplay…seriously, so soapy…) that a number of older fans probably felt like they were being ignored in favor of a new budding audience that the franchise’s move to multiplatform could more easily tap into. And it was probably that imbalance that led to Shadow the Hedgehog as an attempt to compensate, and we already know how that went over with everyone. However these days it feels like it’s a bit more common of an issue. While Sonic Unleashed was nowhere near as complicated or serious in tone as Shadow and 2006 tried to be, it still felt like a bit more of a return to that kind of balance that was missing for a while. A story that had a bit more lighthearted moments and a clear sense of humor to itself, but still one that had a sense of weight and seriousness to it’s premise. An ancient monster of pure darkness is released by Eggman and starts corrupting the populous of the planet, which is by the way quite literally in pieces? Yeah, kind of serious. And yet they still found time to have an occasional funny bit here and there, and they weren’t going out of their way to do so either, they just kind of naturally happened. But with the shifting of cast and other staff led to new writers and a new approach for Sonic’s image, one seemingly meant to try and rectify past mistakes: to make Sonic much more driven by Classic nostalgia and to make the series more humor-driven. And boy has it backfired. I’ll be frank, Colors isn’t exactly my most favorite game out of the series. The hardware it runs on, the style of story and dialogue, and even the pacing of the gameplay just feels like a bit of a downgrade after you complete Unleashed and were in love with it like I was. I mean don’t get me wrong, they did a much better job recreating the Daytime Boost formula for the Wii than they did for the actual Wii version of Unleashed, but even then it really felt like this formula should have stayed on more powerful systems like the PS3 and 360 to really shine like it deserves. But for whatever reason, they made it Nintendo exclusive and even if it was a watered down version of Unleashed’s gameplay, it was for many a much more accessible Sonic game. Aside from the Wii being a more family-based console, the story and presentation itself was set up to be much more “fun-looking” (I mean, the whole game takes place in a giant amusement park in outer space, doesn’t get much more weirdly fun than that, right?). And it’s because of that that I feel that that’s what they were going for, having this be just a “fun” game. No emphasis on a gripping story, no interesting insight into character motivations, not even any sort of reliance on past lore for the series (though the extent of Sonic lore that was explored in Unleashed was just an optional quiz question where you know enough to know that the creature that came out of the planet WASN’T Shadow the Hedgehog, so kudos if you answered that one correctly.). It was trying to lighten its load so that it could focus more on being fun than being perfect, which I guess many people appreciated at the end of the day. Too bad it still had to come at the cost of having an interesting and entertaining story though. Don’t get me wrong, the story wasn’t unbearable or anything (well, maybe a few times), but it certainly didn’t feel quite…right. Like you know how the moment you’re going through Shadow the Hedgehog’s story and you realize “Something about this doesn’t quite feel Sonicy”. Yeah, the same can apply when the reverse happens, and that’s largely what I felt while playing this game, and I still feel it every other time I play it. There IS a premise there, a basic easy to follow one, but there’s almost no focus on it half the time, it’s just more of an excuse to go to different levels and have filler scenes where Sonic and Tails crack many attempts at random jokes that, again, never quite matched the humor the games were known for before. Some of them were funny (for various reasons, be it as intended, ironically, or in hindsight because of meme-status), but many felt like hit-and-miss, trial and error stuff, with plenty of errors. You could clearly tell that this was Pontac and Graff’s first time having to write for anything video game related that wasn’t even remotely tied in to Happy Tree Friends, the whole thing cried a lack of understanding or familiarity with the franchise and it’s characters. The only thing that seemed to remain consistently funny was Eggman, and to this day that is still the case. It’s like going back to watching The Adventures of Sonic the Hedgehog where you’re not really there to watch Sonic and Tails win, but rather to watch Robotnik and his robot cronies keep bumbling up every scheme they come up with, and every meme-worthy moment that comes with it. But beyond that, there was no real tension (except for barely at the last second towards the final boss section of the game, and they tripped over their own feet at trying to build tension over Yacker’s disappearance but then never following up on that), no gravity or weight behind having to stop Eggman other than he’s bad and wants to mind-control the planet. It felt more like an episode of a cartoon show rather than feature-length presentation like the other ones have, for better or for worse. The thing is, the way this story worked, it could have been serviceable. It’s not my preferred way a Sonic story should go, but if it was corrected and tightened up a bit more and they had a better grasp of what they were doing and nailed their humor down to a tee, you could easily make a Sonic game with this kind of a story every few titles or so, when you’re in the middle of development of your next big-engine money-machine Sonic title. But even after Color’s success, it didn’t seem like Graff and Pontac really learned much from how they should approach Sonic, as their work on the story for Generations shows that they barely put any effort into the backbone of the plot whatsoever. At best you have a general sense of what the story is: Sonic’s birthday, friends get kidnapped by time monster and Sonic has to relive his past with his younger self, realizes they’re in the past (no duh), rescues friends, fights Eggman twice, realizes it’s actually Eggman (again, no duh), fights Eggman(s), wins, happy party, happy farewell, happy birthday Sonic, the end. Those are fine as cliff notes, but there was no effort into making it an experience in between those key moments. Even if Colors was slightly simpler than Unleashed, it still had plenty of filler-scenes between every other level to to at least establish the game’s tone and more importantly it’s sense of humor. Generations actually cut out more story content than it was originally meant to have, and no effort was made to fill the void with anything that would have made the game feel less like a ride back home after a trip to an amusement park (you know, the part of the journey that usually feels the quickest and shortest, after all the fun has already happened?). The tone they were starting to build with a few subtle nods, winks, and jabs at Sonic’s history soon fell to the wayside as scenes became few and far between to the point where the characters don’t even bring up any past moments anymore. Again, not surprising, since the writing is coming from two guys who never knew anything about Sonic going in (not that it’s necessarily a requirement, but it certainly helps), and apparently can’t be bothered to watch more than a few random cutscenes to get some idea of what the characters say or are like or what they went through, and even then it didn’t feel like enough in some areas, ESPECIALLY for an anniversary title that’s centered around Sonic’s history. Even the humor they were praised for was largely absent from this story, every scene is just played straight with hardly any expressive character traits other than “Sonic be careful” “I got this!”. Couple this with the lack of incidental music for most of them and these scenes feel more dull compared to those of Colors, at least they were actually trying to get a laugh out of you then. Because of all of this, the story doesn’t really hold much weight until the final boss (again), and even then there’s not much fanfare when things are resolved. As quick as it began, it ended twice as quickly. Then with Sonic Lost World they clearly tried to put more effort into attempting to make a bit more of a balanced story, one with more humorous moments akin to Colors but with a bit more gravity to it’s premise like Generations was intended to have (but again fell short of). Again, the effort is apparent in this game, as there are a bit more character interactions (well, aside from nearly pointless Amy and Knuckles cameos that don’t even amount to much. By the way, were they seriously under the impression that Sonic didn’t know of Amy’s feelings for him!? If there’s anything you should know even if you aren’t a fan of the series, there’s that! ), and the story does go back and forth between humorous moments and at times fittingly tense moments. The tone actually does shift a bit towards the later half of the game, understandably so after Tails has been kidnapped, but from then-on it’s pretty consistently played straight again, only with a bit more scenes to play up the gravity of the situation. It felt like a bit of a step forward after the complete 180 that was Colors and the lazy non-effort that was Generations, but it still didn’t quite hit the mark. At least, not with me. Like the gameplay itself, it felt like it had good ideas of what it wanted for a more balanced experience, but in the end it didn’t qutie mix those elements together in an organic and cohesive way. It almost felt like the plot was bipolar sometimes. Sonic and Tails have a cheeky back-and-forth one moment, the next Eggman is swearing that he will eat the Zetti’s black hearts and Zazz threatens to send Sonic home in a box. Like…what the hell!? (He even literally says that he’ll send Sonic to Hell in his episode in Sonic Runners. Like, are we having an identity crisis again WITHIN an identity crisis?). Even the cutscenes of the last level feel oddly grim, and not in the good entertaining story sense. Like it doesn’t work as a good contrast because the experience beforehand wasn’t largely positive or pleasant, it was a bit all over the place. The darker part of the story just kind of feels like the story is repeating another phase of its cycle but then just sort of stopped there. Then Tails is okay and then we get our hastily put together twist ending that everybody already saw coming 5 years before the game even existed. It was an attempt at something more promising, a Sonic story with a slightly more balanced attempt at humor and drama, but once again the incompetence of Graff and Pontac caused it to fall short. And then there was Rise of Lyric. Yeah I don’t think I even need to go into as much detail with this one. Even ignoring the gameplay you all probably already know the major flaws with the story. Between the sloppy message of the story (Sonic has to learn to actually rely on his friends, herpity derp), the extremely awkward pacing, and the poor implementation of characters like Shadow the Hedgehog, this is probably Pontac and Graff at their worst and lowest point in the series. This was once again another attempt to seamlessly blend together moments of humor and drama, only to completely fall under it’s own weight, as well as that of all the other problems the game has already. So what’s the lesson we’ve learned from all of this? Not that humor is the only way to go, because even if that’s all you rely on, it can still be just as disastrous as any edge-fest if your writers barely even know what they’re doing half the time. No, the real lesson here is that trying to make a compelling or at the very least entertaining and serviceable story with a decent blend of humor, drama, and most importantly for Sonic, ACTION, is a process that not only requires earnest effort, but also capable skill and knowledge of what one is doing and how well it works and is executed. Pontac and Graff may have had SOME promise with their one at the very least decent effort in Sonic Colors (which again, still could have used some polishing up), but by this point in the series they have consistently shown that they can’t really live up to the task and bring home either the effort or skill needed to accomplish that. You want to know why the Sonic Boom tv show is doing much better than Rise of Lyric, yet is even more comedy-centric than the game itself? It’s because it’s actually being handled by writers who have a much better grasp of what they’re working with, what they’re doing, and how to mix things up every once in a while. It’s not a perfect show, and it occasionally has some awkward moments and decisions (Knuckles will probably remain a divisive topic for a long time…), but it still keeps up a better consistency in how effective it’s humor works within its own premise than Pontac and Graff’s does. Hell, it even feels like they appropriated and improved on Pontac and Graff’s initial sense of humor that they gave Colors. At this point I’d probably trust THEM more with writing a story for a Sonic game than these two chuckle-heads. So no, the very idea that Sonic Forces might have a bit more serious of an overall tone than recent games doesn’t really concern me, as at the moment I have no idea who’s actually in charge of writing it. If it’s Pontac and Graff, then oh hell no, I am VERY worried. If they can’t even stay consistently good with comedy and can’t combine it with drama to save their lives, then what chance do they have at succeeding in something where the serious tone is it’s primary advertisement!? But if it’s not them, and it’s actually in the hands of someone different, perhaps someone with much more competent writing skills and basic understanding of how a Sonic game’s story should work, no matter what tone it primarily leans more towards, then I don’t have nearly as much to worry about. For all I know, anyone would be better than these two. Besides, it’s not like this game is meant to be completely edgy either, I still get the sense that it still gets plenty of lighthearted and humorous moments to balance things out, especially if IGN’s reports are anything to go by (huh, never thought I’d say that in a sentence about Sonic…). Hopefully this proves to be a much better return to an attempt at a slightly more serious tone for a Sonic story with enough humor to still make it feel like a SONIC story. As long as Pontac and Graff aren’t involved, we can be a little more hopeful for a much needed change of pace, yet one that’s still familiar enough to feel comfortable with. Cause that’s the real test of whether we’re taking a step forward or not, getting the right talent involved. I didn’t listen to the podcast because I was lazy, yet, I read this giant essay of a comment. My brain works in mysterious ways, lol. But honestly, I highly agree with a lot of what you say here. Shun Nakamura is working on Sonic Forces, so I don’t know of Pontac and Graff are involved anymore… Boy, I hope they just stay with Sonic Boom and leave the main series to the older writers. If Nakamura is writing the story, then I understand the caution people have about it, since he worked heavily on Sonic 06…. but, given the amount of time this game has probably had in development and the more careful decisions SEGA’s made lately, I think we might have a good story on our hands once again. … Of course, I still worry about how time/dimension travel is gonna work (I think Sonic just needs to stop tampering with time for a while), but I have a bit of faith that it’ll be better here than it was in Sonic 06 or Sonic Generations. Finally read that humongous wall of text. People were speculating that this was referring to the new Sonic game that was coming out. Aaron Webber, however, posted on the Sega forums (bit.ly/2mxilsp) that this was just referring to Fire & Ice. So that’s one thing that we can stop worrying about. OH THANK GOD! That was the info that was scaring me for so many months now. I can finally just put all that to bed and actually look forward to this game now. Well, for now anyway. I’m not sure if it necessarily rules them out, it just makes them unconfirmed again. But optimistically thinking, this lowers their chances I suppose. I am aware of Shun’s involvement on the story for 2006, but he’s worked on lots of other titles too, and he’s so far only been listed as the producer for this game, it’s not as though he’s writing it. And even if he was, I’m sure whatever he comes up with would still be a million times better than whatever Pontac or Graff would come up with. Heck, even 2006’s story could have been saved if they were given more time by Sega, I feel like that premise was workable, and let’s not forget that there were multiple outside factors that were hindering that game’s development, Shun alone can hardly be blamed for the whole thing, let alone the story’s final presentation. Though personally, I’d rather just have either Shiro Maekawa or Kiyoko Yoshimura writing the story. Shiro wrote for most of the more enjoyable modern Sonic titles and Kiyoko wrote for Unleashed, my personal favorite of the series. Both have handled slightly more serious tones for Sonic fairly well in the past and I feel that they would be much more trustworthy to handle something like this which is practically advertising itself through it’s more serious tone, so far anyway. Or maybe some new guy or gal comes along to write for the game and they’re even better. Who knows, as long as P & G aren’t involved in this anymore that at least leaves room open for somebody much more capable to take things over, and I feel like now I can finally look forward to who that’s going to be. Now that was a very interesting read. I argee on a lot of points, disagree on some details, but that’s beside the topic at hand. We still don’t know enough about the “seriousness” or “edginess” or “lightheartedness” of Sonic Forces’s script, so I won’t comment much on that. But I strongly agree that from Sonic Unleashed onwards, writers for Sonic seem to be taking too many notes out of Disney/Nickelodeon/whatever toddlers watch nowadays for their comic relief moments. The vast majority of these comic points come out as cringy, at least to me. It’s surprising that Sonic Boom (the cartoon) actually has had more clever and “mature” humor than the games themselves. Again we don’t know much about the gameplay as well, aside that it’s pretty much Generations 2. Modern Sonic to me needs less areas where you boost your way through enemies (and subsequently lose your rings at the spikes which you can’t predict that exist) and more open areas with exploration/different paths. Lost World may feel “slow” to a lot of fans, but it was more satisfying as a platformer than Generations and Unleashed. We still need to learn more about the game though before we start booing or hurraying. Eh, to me you need more of a balance. Sure, exploration and platforming is all fine and fun when it’s needed and welcomed, but when it makes up about 75% of a game that is supposed to center around a hedgehog that can break the sound barrier, it really feels like it undercuts the “speed is key” mentality that I always saw the series having since the Genesis days. Yes, even back then when they were 2D platformers, they still knew that they had to emphasize Sonic’s speed as his selling attribute, otherwise he would have been just like any other platformer or explorer game out there. I prefer Unleashed and Generations’ gameplay because it capitalizes on what is arguably Sonic’s most important selling point: HIS SPEED. If it weren’t for how fast he was going, I can admit most of those levels would have felt like wide hallways with fewer optional directions other than forward. But again, that’s essentially what the series was like back in the old days too, just at a different viewing angle. I feel that it’s most faithful to that spirit, but I understand most other fans want to seem more elements of openness and explorability from time to time, so I can’t deny that when done well for Sonic, it can really help. Sonic Adventure seemed to have a decent sense of wider areas that still followed a set path-direction that allowed for some optional moments of explorability should the player choose to partake in it. And even some parts of Unleashed actually had wider ranges for the player to snoop around and discover things with, although it wasn’t as emphasized because it wasn’t supposed to be, the SPEED was. That open exploration element is not an element that HAS to be in a Sonic game for it to feel like a Sonic game, but it doesn’t hurt to have it in either, especially if it’s handled really well. I don’t think it should ever be handled the way it was in Lost World, that whole game just felt like an unclear mess to me, but it should still be considered whenever the question of “how do we make Sonic choose between different routes of a level?” comes up. The way I would probably approach it would be to have more unique looking alternate paths. Not short little allyways or shortcuts or what have you that still stick pretty close to the main path, but dedicated paths that have features and characters all to themselves that make them just as appealing to go down as the main path. I mean, there should still be extra incentives like one getting you to the goal a bit faster and one having more items and such, but my point is that they should be more distinct and appealing to go through. I guess something similar to how Seaside Hill Act 2 was handled in Generations, where there were so many different paths and routes to take it is practically impossible to go through them all in one playthrough. I still think they should each be focused in getting you to a goal, but the idea of choice is probably what most people are looking for anyway, so maybe that might be enough.